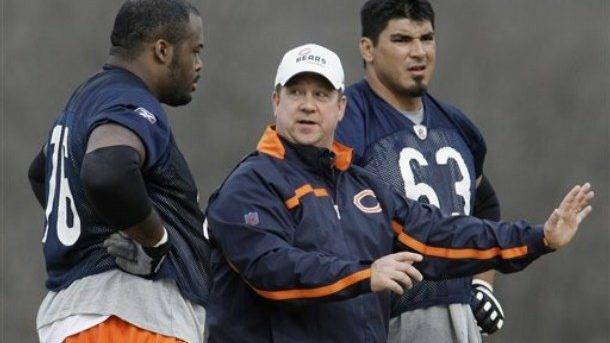 As coach Matt Nagy and offensive coordinator Mark Helfrich take on unfamiliar roles atop the Bears coaching staff, they value the experience offensive line coach Harry Hiestand provides. Nagy is a head coach for the first time, while Helfrich has never coached in the NFL. Meanwhile, Hiestand has been a line coach for 32 of his 36 seasons in coaching. This will be his sixth NFL season and second stint with the Bears, having coached on Lovie Smith’s staff from 2005-09. Teams place heavy importance on their offensive line coach relative to other positions because a quality line makes everything go. It’s necessary to protect the quarterback and trigger the run game. Plus, the offensive line is a tone-setting group for the entire team. Nagy believes the Bears have the right guy in Hiestand, who returns to the Bears from Notre Dame, where he served from 2012-17. He replaces Jeremiah Washburn, who coached on John Fox’s staff only for 2017. Washburn replaced Dave Magazu, Fox’s friend who was fired after two seasons. Hiestand was on the Bears staff in the mid-2000s when linemen Olin Kreutz and Ruben Brown became Pro Bowlers. Helfrich, for his part, indicated he feels good about the linemen Hiestand has at his disposal. He singled out tackles Charles Leno (26 years old) and Bobby Massie (28) in explaining why he believes the Bears are close to being successful. Specifically, he referred to quarterback Mitch Trubisky’s supporting cast. Projecting Hiestand’s group for 2018 involves several givens and a few variables. The Bears extended Leno’s contract last August. The four-year, $38 million deal, which includes $21.5 million guaranteed, prevents him from entering the free-agent market, where he likely would have found a richer contract. Right guard Kyle Long is trying to get healthy this offseason. He has had neck surgery and plans to have the torn labrum in his left shoulder surgically repaired. Interior lineman Cody Whitehair has played guard and center, and general manager Ryan Pace believes in his potential as a smart, heavy-handed blocker with leadership traits. At left guard, the Bears must decide before March 9 whether to pick up Josh Sitton’s $8 million in salary and bonuses for 2018. Massie, meanwhile, is under contract for next season at a modest price. He is scheduled to earn a non-guaranteed base salary of $4.25 million, and he has a $1 million roster bonus due March 16. So Pace and Nagy have some choices to make, but it’s clear they’re confident in the position coach leading that unit.